Haven't figured out a costume for your kiddo yet? Parenting has a great article for you! 35 Easy Homemade costumes, all you need is scissors, glue and paint! I love homemade costumes. 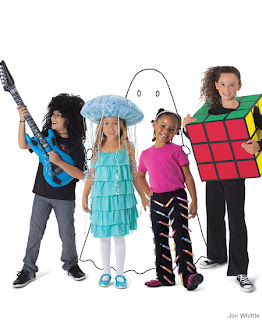 I wish I could get my kids to stray away from the commercialized costume business. They are expensive and usually don't last long. This year I only had to buy 1 costume, thank heavens! We borrowed and came up with one for my little girl, but maybe next year I can convince them to make their own. Today we are doing our traditional Haunted Gingerbread houses! Can't wait! It's a sticky and sweet mess! Have a good Monday!